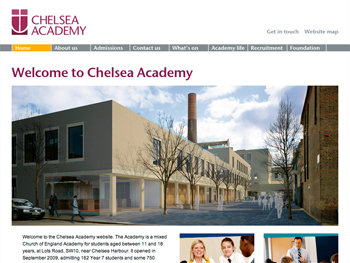 Chelsea Academy is one of the new London academies, jointly sponsored by the London Diocesan Board for Schools and the Royal Borough of Kensington and Chelsea. It is the first new state secondary school in Chelsea in over 50 years, and opened its doors to the first students in September 2009. I’ve been working with the Academy since April 2008, firstly by designing the website in compliance with their existing identity guidelines. Since the site was launched, I’ve worked as the site editor and developer, adding new content, and changing or adding to the structure as the communication needs of the academy have developed. We’re currently translating the website from its existing html format into Expression Engine, a widely used online content management system. This will allow a team at the academy to manage the day-to-day maintenance of the site.